The new railway line between between Tinaco and Anaco will add to the existing 13,000km national railway network of Venezuela. Image courtesy of Ministerio del Poder Popular para Transporte Terrestre. The Tinaco-Anaco railway line will be 290 miles (466.7km) long. Image courtesy of Ministerio del Poder Popular para Transporte Terrestre. Construction of the Tinaco-Anaco railway line started in 2009. Image courtesy of Ministerio del Poder Popular para Transporte Terrestre. The project involves construction of a tunnel and 25 bridges. Image courtesy of Ministerio del Poder Popular para Transporte Terrestre. A two-way viaduct is being constructed as part of the Tianco-Anaco railway project. Image courtesy of Ministerio del Poder Popular para Transporte Terrestre. The Tinaco-Anaco railway line in Central Venezuela was launched for construction in 2009. The railway line is among the 15 primary lines that the government plans to construct in the next 20 years. The construction of the new line is expected to be completed in 2013. "The new railway line will run along the coast, at an approximate distance of 140km from the Caribbean Sea." The 290-mile long (466.7km) Tinaco-Anaco railway line will start at Anaco, located in Anzoategui State, and extend up to Tinaco of Cojedes State, passing through Guarico and Aragua. Venezuela has never undertaken such a massive project as the Tinaco-Anaco line, in sectors other than oil. The new railway line will run along the coast, at an approximate distance of 140km from the Caribbean Sea. It will reduce the costs of cargo transportation in Venezuela. It is expected to benefit both workers of Orinoco oil field and farmers. The farmers and workers are currently heavily dependent on trucks. The Tinaco-Anaco railway line will join the 13,600km long national railway system, upon its completion. The project will generate more than 5,000 direct jobs. The Tinaco-Anaco railway line project is an element of the National Rail Development Plan, which aims to build approximately 8,500 miles of railway lines by 2030. The new railway line will transport 190 million tonnes of cargo and 210 million travellers, annually. The primary objective of the project is to link the industrial city of Anaco with Tinaco, where agriculture is the major activity. The final part of the project will get underway in the town of Anaco. It is projected that more than 1,600 contracts will be awarded to competent local personnel of Anaco, as a part of the last leg of the railway line project. The Venezuelan highways are being overburdened with the heavy trucks used for transportation of goods. An extensive railway network to transport cargo has been a much needed measure to reduce the burden. In addition, travellers are in need of a comfortable means of transport within the country. The current project and the National Rail Development Plan are aimed at resolving these issues. 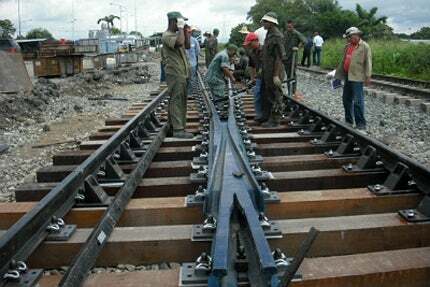 The railway route will have ten stations connecting the states of Anzoategui, Guarico and Cojedes. The stations Anaco and Aragua de Barcelona will be located in the state of Anzoategui. Zaraza, Tucupido, Valle de la Pascua, Chaguaramos, El Sombrero and Dos Caminos stations will be located in Guarico State. El Pao and Tinaco are the stations that will be constructed in the state of Cojedes. The project will also involve the construction of 25 bridges and one tunnel. Approximately 548 trains will operate between Anaco and Tinaco, upon completion of the new line. The trains will be designed to reach a top speed of 137mph (220km/h). The Tinaco-Anaco railway line project has been funded by the China-Venezuela Strategic Development Fund, which was formed in 2008 to enhance the economic ties between the countries. China and Venezuela entered into a $7.5bn joint venture to build the 290-mile railway line, in 2009. China Railway Engineering Corporation (CREC) has a stake of 40% in the project, with the rest being held by Venezuela. "The new railway line will transport 190 million tonnes of cargo and 210 million travellers, annually." CREC is carrying out construction of the railway route, with approximately 20% of the work being completed as of 2012. China has established factories in Venezuela to manufacture train cars, sleeper cars, rail-welding equipment and switches for the new line. The factories will also manufacture locomotives in future. China Railway Eryuan Engineering Group (CREEC) was awarded the contract for design and survey works related to the project. A number of joint ventures for technology transfer will be formed between Venezuela and China, as part of the project. The Caracas Metro is a mass rapid transit system that connects the greater part of Caracas, Venezuela, South America. The Brazilian light rail operator Metrofor is modernising its existing rail network in the city of Fortaleza.